I gave this talk at the J. Boye Conference in Philadelphia last week (GREAT conference by the way. I already verbally committed for next year). My slides are posted on the J. Boye site and you can also get them on SlideShare. So it is really a mistake to think of it and evaluate it as just a software project. Every project goes through this roller coaster. The business case and software sales process raise expectations by talking about the potential of the solution — long term potential. 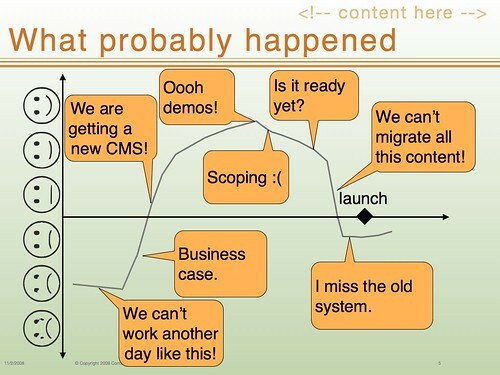 Launching a new CMS is a tough transition. It doesn't feel anything like the rosy future you were promised. This is a time when you are supporting two sites: you need to keep the wheels on the old site as you migrate content onto the new site. The new tools are unfamiliar to content contributors. They don't know the short cuts and work-arounds. The content you are moving is not as good as you thought so there is unplanned work to improve it. There is organizational pressure to show results for all the money spent. You were probably thinking that you were crossing the finish line but now you realize that the real work is starting and it is going to be a real slog. There is going to be a dip. It is just a matter of amplitude: how high did you let your expectations get and how much pain did you go through around launch time. A great project may not dip below neutral satisfaction but I have never seen a project easily achieve the loftiest of hopes for it — at least not on day-one. 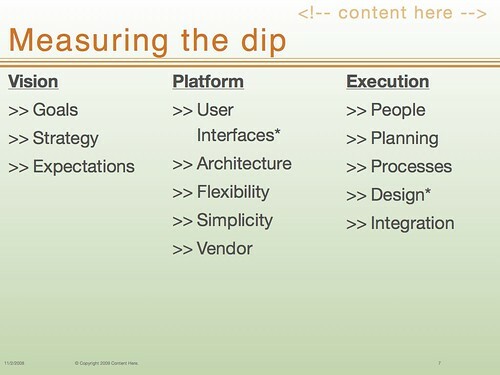 Grading a CMS implementation is matter of measuring the dip and we do this in three dimensions: Vision, Execution, and Platform. Vision is what you are doing and why. Execution is your action against that vision. Platform is the tools that you build on. Another way to look at it is you have vision driving execution which then produces results that inform vision. This cycle is supported by a technology platform. You should have defined, communicated and aligned behind goals. Every stakeholder should be able to give an elevator pitch stating the goals, why they are important, and their role in helping to achieve those goals. Goals should be related with organizational goals. I didn't go into content strategy too much here because that is a huge topic on its own. 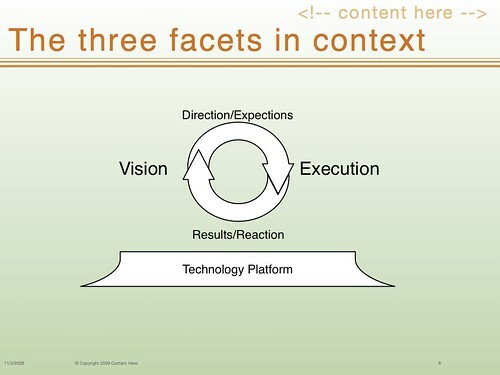 I merely introduced what I call the first principles of content strategy. If you have a good handle on audience, information, and behavior, you are probably on the right track to a good content strategy. A shovel doesn’t magically produce a hole. A new shovel will be most appreciated by someone who has been desperately scratching at the earth with a stick or his bare hands. Digging is hard work. 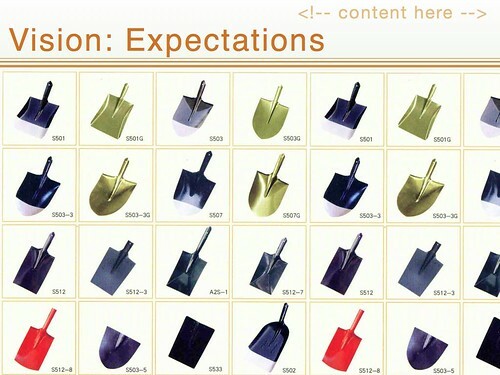 A shovel makes the effort more productive. Similarly, content production and management is hard work. It's hard to learn and serve your audience. A CMS is like a hand-tool. The right tool will make a dedicated team more effective. If you thought you were getting out of hard work, your expectations were probably unrealistic. 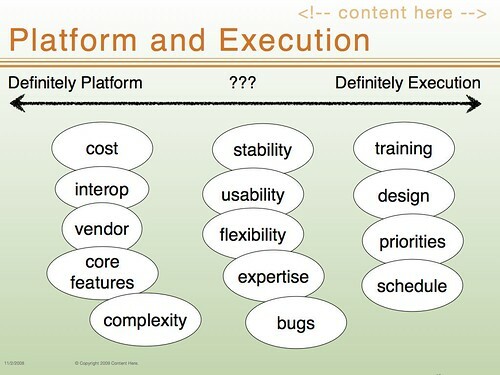 Platform and execution are often difficult to pull apart. The platforms are so configurable that it is not easy to tell if an issue is intrinsic to the platform or if it was self-inflicted by the execution. Different elements tend to gravitate toward one side or the other but there is a big grey area. Training is the single most important component of any content management initiative. 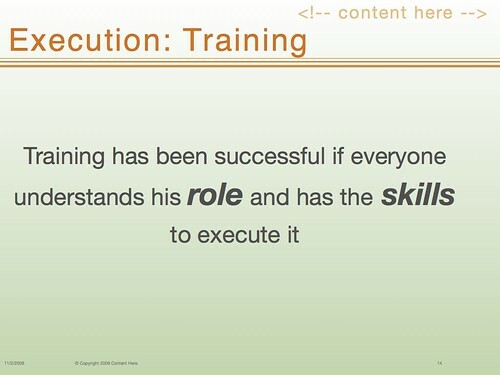 If your training program is successful, your users will know their roles and have the skills to perform them. They will be able to achieve their goals no matter what obstacles are thrown in front of them. Unfortunately, training is an afterthought in most content management initiatives and is funded by budgetary scraps left over from earlier phases. You need to think about training 4 stakeholder groups: contributors who add content and participate in workflows; developers who support and enhance the solution; administrators who keep it running; and visitors who consume content. I got a little push back here by people who took the last group literally. I don't mean dragging all the site visitors into a classroom. My point here was that when you make major changes to your website, you need to think about how to help your visitors through the transition. Don't believe me? Remember the Facebook, Digg, and Gawker redesigns and all the agida they produced? Visitor training strategies may include redirects so the old URLs work, search functionality that maps old terms to new terms, and instructional text. Time classroom training so it happens right before trainees need to do the work — so they don't forget what they learned. Closely monitor and support users as they are starting to work on the new platform. This is when habits are formed (the good ones and the bad ones too). Content modeling is important because it determines how content is stored and managed in the system. This has implications in how content is authored and, more importantly, what you can do with the content. More structure means better reusability but it also makes the content contributor more dependent on the template developer to control what the visitor sees. You need a balance. In order to achieve that balance, your content contributors need to buy into the notion of separating content from layout and you also need to give them formatting tools where they need them. This is an example of unstructured content. The editor used styling to give the impression of structure. The CMS would have a hard time doing things like creating a summary of this content on an index page or optimizing this page for a mobile device. After beating this example up, I will defend it by saying that in this case a wiki was the right tool because the organization didn't have access to presentation template developers, had plenty of content editors, didn't have a lot of content, and needed to be nimble. A wiki is not a bad platform for Wikipedia either. So the amount of structure really depends. Here I gave my Manufacturing/Legislation metaphors of workflow. 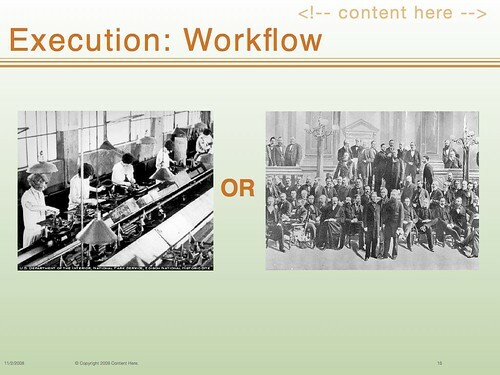 If you want to increase efficiency with workflow you need to have specialists at the ready to help produce content. Workflows dominated by approval steps publishing down. Don't aspire to the assembly line but create Congress. 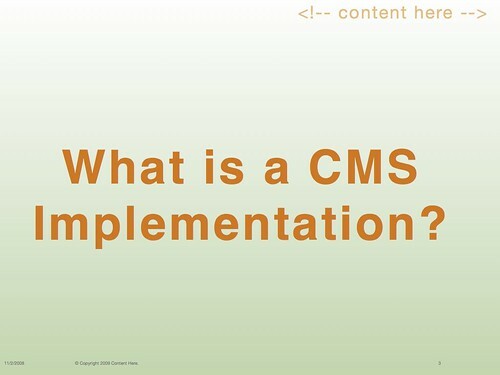 Most of the technical effort of a CMS implementation is usually in developing presentation templates. This is where all of your display logic is. 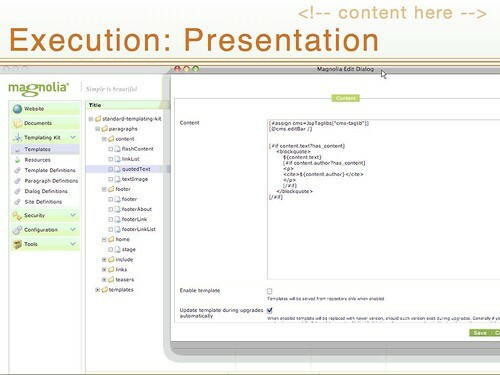 Any visitor-facing behavior is also coded in presentation templates. There are two ways to fail here. Inefficient code that does not use caching effectively or has sub-optimal content queries will cause your site to become unstable when under load. Sloppy, repetitive coding will be a long term maintenance nightmare. 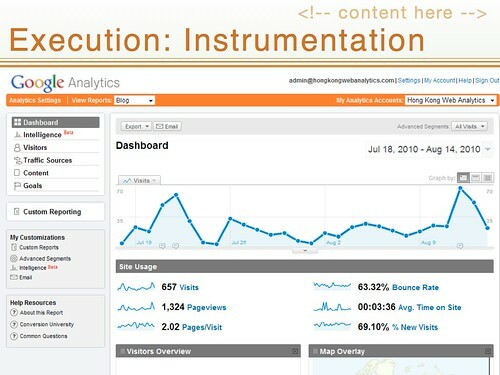 Instrumentation is more than just tracking hits and unique visitors. Those metrics can be useful for signaling major issues and trends but you really need to be tracking data that will tell whether your strategy is working or not. 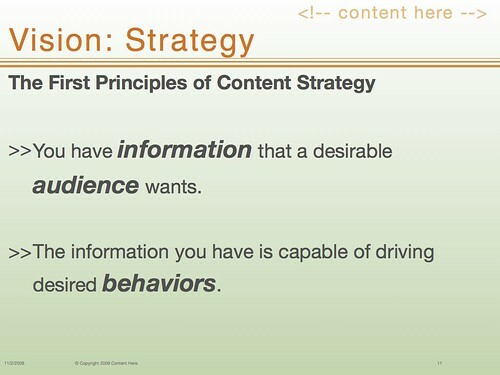 This gets back to my point that content strategy is based on Audience, Information, and Behaviors. Instrument your site to tell you whether or not your information is driving the right behaviors from your audience. Collecting the right data will help you refine your vision and strategy so you can iterate toward long term potential that your business case promised. At the end of the session, I handed out this Content Management Assessment worksheet. I encourage you all to think about a CMS implementation you were involved with and grade it. How did you do? If that was fun, please take my survey!